Juneathon Day 7. No sorry, I didn’t run twice today. The title refers to our supper choice this evening. I didn’t make it out at lunch time as planned.I was distracted from getting my work done by the unbearable noise from builders demolishing half of next door and the council digging up the road in front. I also spent part of the late morning in a complete strop because for the second week running first class mail has not delivered my graze box on time (last weeks is still “on its way” as we speak). So I had to carry on working over and after lunch to get stuff finished and even ended up forgetting to eat. I decided to repeat the winning combination of going out for my run at 5pm ish and strutting my stuff to the Bee Gees which had worked so well yesterday. Good idea. I returned from my run with sunny mood restored. I did however start in the other direction today, not wanting to be spied running the same streets in the same bright orange top. (I know – dirty girl! But it is Juneathon). Now today being Tuesday and with husband and father (and non-pizza lover) being away, the rest of us feeling in need of a little treat for exams, exam results, not eating lunch and non-delivery of graze boxes the obvious choice for supper was Dominos! Juneathon week 1 : 5 runs, 18.1 miles. 2 BMF classes. Janathon week 1 comparison: 7 runs, 26.32 miles 1 BMF class. Categories: Uncategorized | Tags: Juneathon, lego, pizza, Running | Permalink. This is may favourite Lego man to date. Love Dominoes!!!!!!!!!!!!!! Blaming it all  on the nights on Broadway ….actually I’m blaming it all on Juneathon…the blisters on the tips of my toes, constantly washing minging kit, feeling guilty about eating this whole bag of randoms! No actually I’m loving it! You’re doing really great to juggle the exercise with all the other things, well done! Week 1 completed…onwards and upwards! That’s one of the best tracks – a good anthem for Junethon! I take it you’ve downloaded some Bee Gees. Enjoy! it’s doing wonders for my ‘easy’ pace! I hope the orange top went on inside out, or is that for the third wear tomorrow? Oh Dominoes… I LOVE Dominoes but I don’t let myself eat it… which is weird I know… there’s very few foods I love but never eat… too much guilt you see… OH, but I LOVE Dominoes… mmmmmmmm…. Hahahaha!! Exactly far too much washing if you don;t re-wear! 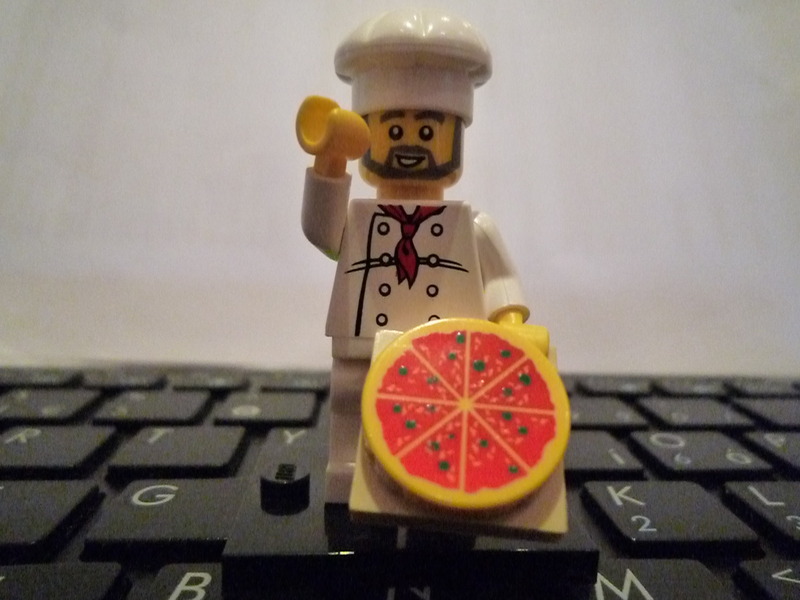 Great little man…the pizza actually looks delish! Don’t know about dominoes, but pizza just has to be done. Is it a pizza, or is it an ultra-healthy grapefruit! Let’s hope that the orange top doesn’t make a THIRD outing before it sees a washing machine, missey!